Gear Forward, founded by 40-year-old executive director Scott Gauvin, was developed as a way to give back to our youth in Springfield and beyond the Midwest. Scott, who lives in Springfield with his wife Joanna and daughters Grace and Gabby, wants to encourage our youngsters to get active, outdoors, and experience the natural beauty around them by putting much needed gear into the hands of those who need it most. Eighteen21.com teamed up with Scott to learn more about Gear Forward and share not only his passion, but also his mission. What exactly is Gear Forward? The outdoors is our collective greatest treasure and gift that we offer the next generation. Gear Forward simply is about providing the next generation of stewards, adventurers, Scoutmasters, and Girl Scout Leaders the resources they need to get outdoors. No child should be denied access to everything the outdoors has to offer because they don't have the necessary equipment. 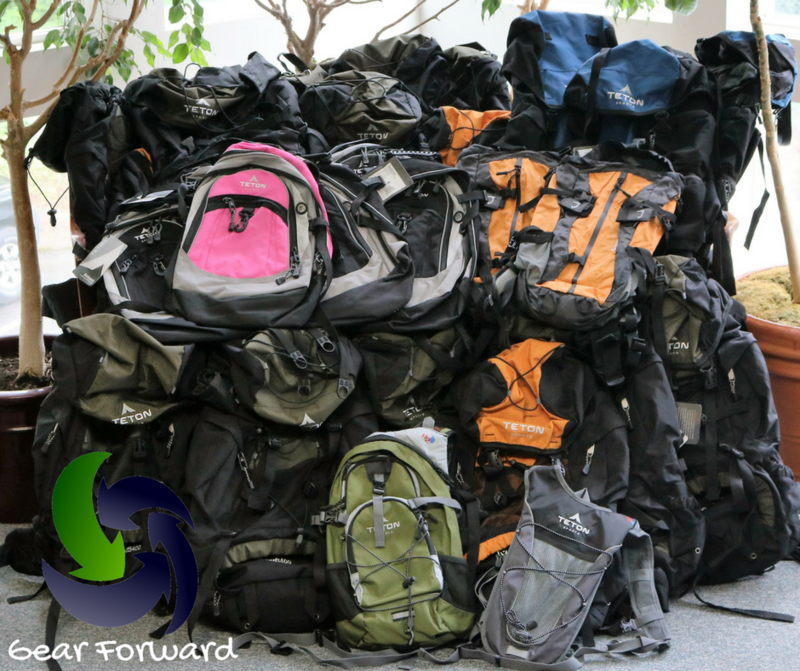 Through the collection of gently used outdoor gear, Gear Forward works with other youth and outdoor focused organizations to help get donated gear into the hands that need it. Where is Gear Forward located? Gear Forward is everywhere, given our purpose to serve as a network. However, the hub of the activity is based here in Springfield, IL. When did the idea for Gear Forward come from? In late 2015, the idea was developed to give back. Having been a blogger for quite some time, I was in a stretch of my blog, Hiking Forward, where I wanted to pursue a different angle or focus. During this period, I was regularly receiving gear from companies to review and test. The gear began to pile up and subtle hints from my wife about the amount of gear strung about the house and my garage began to mount. Soon the two avenues merged. I began talking with friends and colleagues that volunteer in scouting, or work in the not-for-profit sector, and also began doing research to see if anyone else was doing something similar. To my surprise, no other organization was in existence that had the same mission and focus of what would eventually become Gear Forward. Why was Gear Forward started? I grew up in southern New England, and the story of Gear Forward is really my own. My mom was a single mom when I first started in the Boy Scouts at a young age. If not for my beloved Scoutmaster, who kept all sorts of gear from the army and scrounged about to get us uniforms, I wouldn’t be an Eagle Scout, have a passion for the outdoors, an outdoor blog, or be instilling the same passion and principles of the outdoors in my young daughters. Gear Forward is my way of giving back; my adult Eagle Scout Project if you will. When I was in scouting it was not uncommon for kids to show up with their bedding and pillow from home in a black hefty trash bag for a weekend camping trip. This is still a present problem throughout the country. We want to ensure that the youth stays in his/her outdoor program and the gear will make the difference. Giving a young person their own tent, sleeping bag, or backpack when they have never dreamed of it will change them forever. I believe I am a better person for being engaged in the outdoors, the outdoor community, and everything that comes along with the outdoors. I want to give as many kids as possible the chance at experiencing the outdoors the way I have. How does Gear Forward help those in the community? We all say our kids need to be outdoors now more than ever. The lure of electronics tends to keep our kids indoor versus out. If more children stayed in outdoor themed programs and initiatives, we may get to a true place of balance similar to what we remember from when we were kids. But in order for kids and outdoor programs to survive and be successful they need gear. Simply put, that’s where we come in. Via our network we work to help provide a single youngster the gear he/she needs, or work to satisfy the needs of a whole troop just starting out. To date, how many individuals has Gear Forward assisted? Hundreds of youth (mostly in scouting so far) from around the country have been the direct beneficiary of individual acts of kindness and giving from the outdoor community at large as well as retailers and manufacturers who give back through Gear Forward. Does Gear Forward currently partner with any other local businesses or organizations? Gear Forward would like to help youth in Springfield and Central Illinois get outdoors as well. Presently, we have not had the fortune to partner with any local organizations. One of the surprises about running Gear Forward has been the ease of attaining needed gear. When doing the research for establishing Gear Forward, we thought for sure that finding the needs would be easy and getting people to let go of extra gear would be difficult. However, just the opposite has been true; we work daily to identify needs to fill. Are there any annual events or fundraisers that Gear Forward is a part of? Later this summer, Gear Forward will be releasing an online peer to peer annual campaign. The campaign will be nationwide and will give the person engaged the ability to designate where the funds will be used as well as the donated gear they help collect through the campaign. The campaign will have multiple outdoor gear prize packs for the top fundraisers and gear donated. In addition to the outdoor gear, winners will also be offered a spot on an outdoor epic adventure next spring with the Gear Forward ambassadors. Gear Forward is currently selling t-shirts in both adult and youth sizes and Gear Forward stickers on our website. All the proceeds generated from the sale of these items go directly into purchasing new gear to help facilitate satisfying the needs we identify around the country. Is there anything new or upcoming that we should be aware of? We are in the process of recruiting ambassadors from around the country to help harness the gear from their local communities and place it back where needed locally. Outdoorsy people have tons of outdoor friends, all usually with way too much outdoor gear. This local network is also usually tied into outdoor themed youth groups that may have a need. Gear Forward is simply here to serve as the network and conduit to take gear not being used by the outdoor community, or unsold gear from manufacturers and retailers, and place it in the right hands. How can we as a community contribute to Gear Forward’s mission? Take a look around your house; do you any outdoor gear lying around that is just taking up space? We can help give that unused gear a new lease on life by getting it into the hands of the kids who truly need it. In addition, if your children are in outdoor themed organizations, let the organization know about Gear Forward. We offer gear to organizations that have youth in need, no questions asked with nothing required in return. We just want to help kids who want to get outside the resources they need to do it. For more information or to get involved with Gear Forward, please visit www.gearforward.org. You can also follow Gear Forward on Facebook www.facebook.com/gearforward, Twitter @gearforward_org, and Instagram @gear_forward. For questions, please email gearforward@gmail.com.